Daza, Jaén, in the early 60s: Pablo Suances, a sensitive, restless teenager is beginning to find that his home town is a little too small for him. The only thing he’s enthusiastic about are the drawing classes he takes with Vidal Lamarca, a man who has borne the insufferable stigma of treachery since the war. Vidal is also teaching Raúl Colón, Pablo’s friend, and his mother Rosa Teba, a woman from the north of Spain who is utterly bored by Daza and who begins an affair with Vidal. Pablo, a secret witness to the adulterous romance, begins to learn about the adult world and the guilt and secrets that simmer under the surface of provincial life until they bubble over into unexpected acts of violence and bravery, the roots of which stretch back decades. 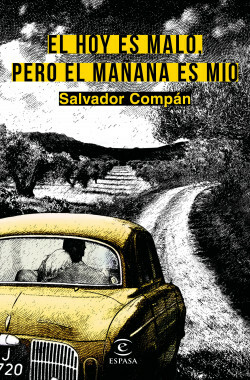 Salvador Compán, a finalist in the Premio Planeta in 2000, is an author with a well-established literary reputation. Exquisite but eminently accessible writing. A genuine pleasure to read. This is a rich novel with brilliantly drawn characters whose passions and emotions are recounted in exquisite, gilt-edged prose.